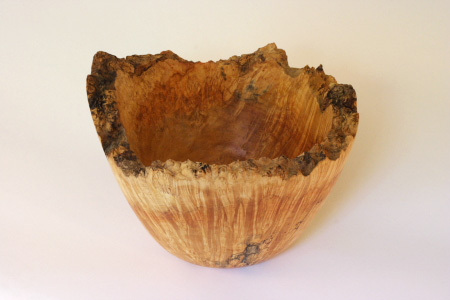 My good friend and wood turner Dustin Coates of Etna, New Hampshire, sold me a piece of burl wood a year and a half ago. I wanted to wait until my skills improved before tackling rare and expensive wood. So I finally got my courage up to tackle this large piece of spalted box elder burl. A burl is a dense collection of germinal centers, each of which would sprout if conditions were right. No one really knows why they form but many surmise that it is a plant reaction to injury of one form or another. The growths are on the outside of the tree and look like tumors. Since the grain runs every which way inside they produce beautiful patterns when you cut across them. 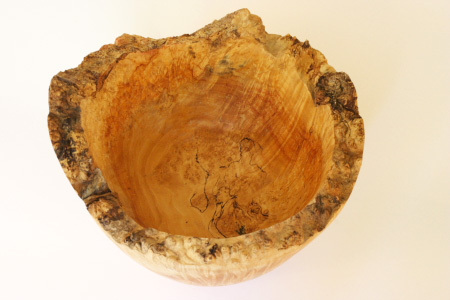 This was not only a nice burl but it was spalted, or attacked by fungus as well which adds to the visual interest but makes it tricky to work. I roughed out the piece on the bandsaw and then turned it between centers to get the preliminary outside shape. I turned a tenon or plug on the lower end to mount in the four jawed chuck when I removed it from between centers. Perhaps I tightened the jaws just a little too much on the tenon for when I went to hollow out the center by coring it out with a coring tool, it snapped off. Now I had a bowl shape with no means of making it spin in the lathe. There was no choice but to put it back between centers and cut another tenon, sacrificing some of the base of the vessel. This time I was very careful with my coring and the tenon held. Since the natural edge of the burl looks like a mountain range when you remove the overlying bark, I wanted to leave as wide a rim as possible to highlight this feature. 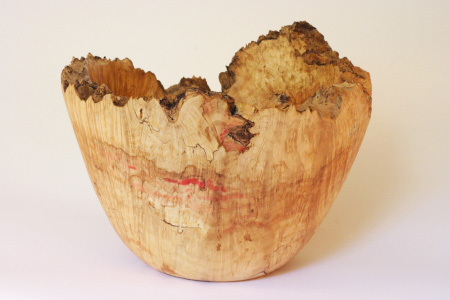 Another feature of box elder is that it is subject to areas of pink to red color which add to the visual appeal. Unfortunately this color fades over time with exposure to light but it is great while it lasts.